alright, i have found a shitload of these brown shrooms all over tha place recently and were hoping to get them I.D.'ed. 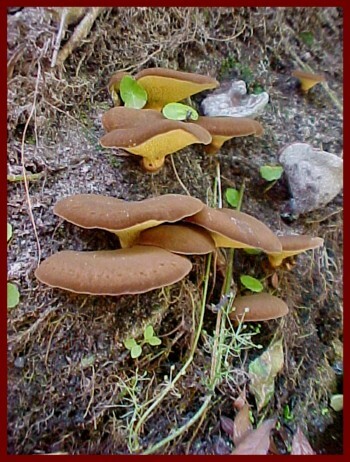 Brown, Leathery Cap. usualy ranging from 1-5 inches wide. No Gills!! But yellowish tube-like holes where the gills are supposed to be, i am assuming this is where the spores come from. rappid Bruising blue-green whent pinched. is this Psychoactive? or poisoness? i would like to know ASAP!! any help wouldbe appreciated. It's a bolete. Edibility unknown from what I can gather. Don't eat. Not psychedelic. cant wait to pick some and see how they taste... oh, if only it were magic... i would be sitting upon a gold mine!! Did they look anything like this;? Edited by GGreatOne234 on 06/11/01 10:04 PM. There are hundreds of bolete species, most are choice edibles. On most, the cap and the tubes peel right off revealing the mushroom meat inside. Yes, GGreatone, those look very similar to the ones that grow down here, i have also found some with red caps. Another thing that rises a question though, why do they bruise blue if they are not magic? i thought bluing of a mushroom was a sign of psilocyn (sp?) and psilosybin (sp?) joining with the air...... any ideas on why this happens? Well I took that picture a couple days ago, here in southwest florida. Where you at? The rule is not to eat any Boletes that stain blue, also avoid any bolete with orange to red pores. There is no Psilocin or any other psychoactive chemicals contained in any boletes as far as anyone knows, and the bluing reaction has to do with the chemicals contained in the mushroom.. every mushroom species has its own unique chemical make-up. The SE certainly has the greatest diversity of boletes in N. America, so your rule of thumb is probably the safe way to go. Out here in Oregon the rule is just avoid the ones with red or orange pores. We have some yellow-pored blue stainers (like B. zellerii) that are decent safe edibles, and numerous Suillus species or "Slippery Jacks" (yellow elliptical pores, blue staining, slimy caps) that are harmless but mediocre to disgusting when cooked. Of course the best are B. edulis--large brown to reddish cap, white pores, white netted bulbous stalk, NO bluing ever. These IMO are the most delicious of all mushrooms, and utterly unmistakable for anything poisonous. Of course, you gotta beat both the other pickers & the bugs to 'em--they get wormy real fast! 2,182 topic views. 16 members, 112 guests and 16 web crawlers are browsing this forum.